Wow! It's been some time since I wrote anything on my blog. It's been a crazy two years. Two of my sons have had many problems and it has been a challenging time - both in terms of my time and my emotions. I think I've become wracked with anxiety at times and it has frozen my ability to take action on many fronts. But through it all I have continued to sew - I think there have been times when without sewing I would have lost it completely. Sometimes I have achieved very little and other times, I've achieved more. But the ability to immerse myself in quilting has saved my mind and soul in many a difficult moment. I'm hoping to become more prolific on my blog in the next twelve months. Not only with my sewing, but we are planning to move north near Childers, Queensland. We have owned a block of land here for 8 years. By the end of 2017 we hope to have made the move here permanently. It's a scary thought to be moving 6 hours away, but exciting at the same time. Part of our block of land at sunset. My oldest son and his partner are making the move with us. We are building a new house - which is very exciting. So, it's time to cull and sort and plan. What to take and what to leave - big questions. My parents moved into a Nursing Home in November 2016. So, their house also needs sorting. My two swimmers are continuing their campaigns to get to National Age Champions in April, so there will be lots of Swim Meets and training and all things associated with sport at a higher level. Lots of early mornings as well - 4 mornings a week we get up at 3 to be on the road at 4am, so it keeps me busy. I'm enjoying the holidays - as always. I'm loving the lack of structure to my days and the ability to relax and take life a little more slowly. This will, of course, include lots of sewing. 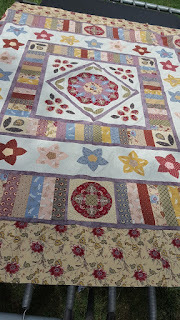 I have finished this quilt top between Christmas and New Year - Jane's Garden, by Veronica Appleyard of Appleyard Cottage. I loved every moment of this stunning quilt. Can't wait to get it quilted. 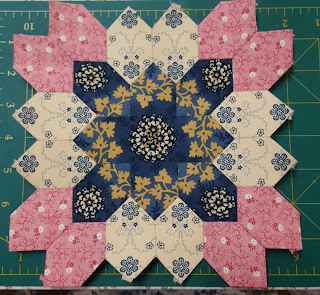 Another of my favourite quilts that I'm working on as a Block of the Month is Lucy Boston's Patchwork of the Crosses - I'm getting my blocks from Sandy Cousins of Shiralee Sitches. I'm up to Block 28 of 56. Beautiful colours selected by Sandy. Can't wait to see this one finished. School is back and so is the routine of the school week. This year my days are a little more complicated as both my parents need help with transport - to get to various medical appointments. My father will go in for his second knee replacement surgery on 2 March, so there are a few medical appointments to attend to between now and then. Swimming is back on in force and rehearsals have started for the new play our local theatre company is doing. So costumes need to be started. Last Sunday was our Swim Club's annual carnival. We were involved in the organising of the carnival, so life was a bit hectic. Son No. 4 is one of our swimmers and his first event was the 200 metre Individual medley. I could see that things were not right for him as he swam, but he did continue to swim. When he got out of the pool he could not move his shoulder. An ambulance ride to the hospital and an x-ray and they believe that he has dislocated it, but that it did right itself. He's still in a lot of pain and has pins and needles down his arm. These could be from the swelling and bruising in his shoulder or could be something more sinister - in that his shoulder has not popped back ok.
We spent yesterday getting our own doctor to look at it and he referred us to our main children's hospital to get them to look at it. We go back again in a day or two. I think his swimming will be over for a little while. His shoulder needs to heal and heal properly. Not much a swimmer can do without his shoulders working properly. Unfortunately, its the peak of the swimming season here - with State championships and National Championships coming up very soon. He was also hoping to make the State Team for Swimming this year. Oh, well, I think we have to work towards next year. Sewing takes a back seat at this time of year. But I have a photo of the stitchery I have completed of Michelle Ridgeway's Calendar Bears. Really looking forward to the next installment. They are being published each month in Country Threads Magazine. They are beautiful little bears. Michelle is a very talented designer and does some beautiful work. I'm trying to do more work on my EPP project of 1/2 inch hexagons. I've been working on it for so long and it is growing - would love to see the main section of the quilt finished this year. Such small pieces means its quite challenging, but I'm loving the way it looks. 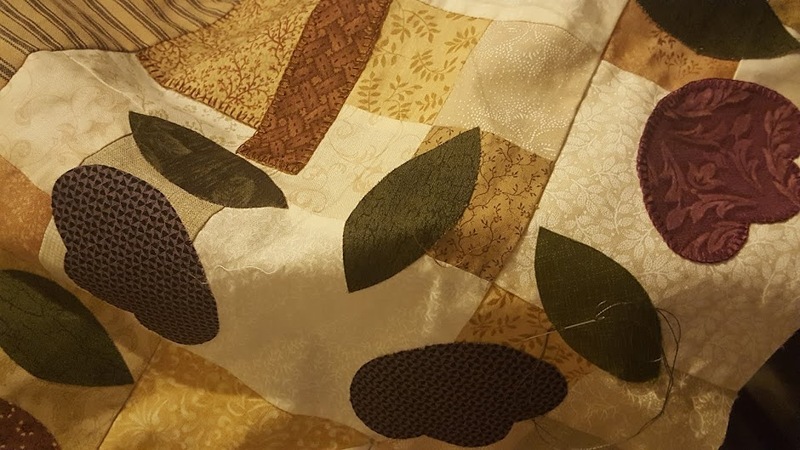 Every piece of the quilt is a half inch hexagon. Just amazing what you can do with EPP. Today started early - leaving home at 7.15 to take number two son to the second day of his TAFE course. And then I met up with friends from our sewing group to see two great exhibitions based on textiles. 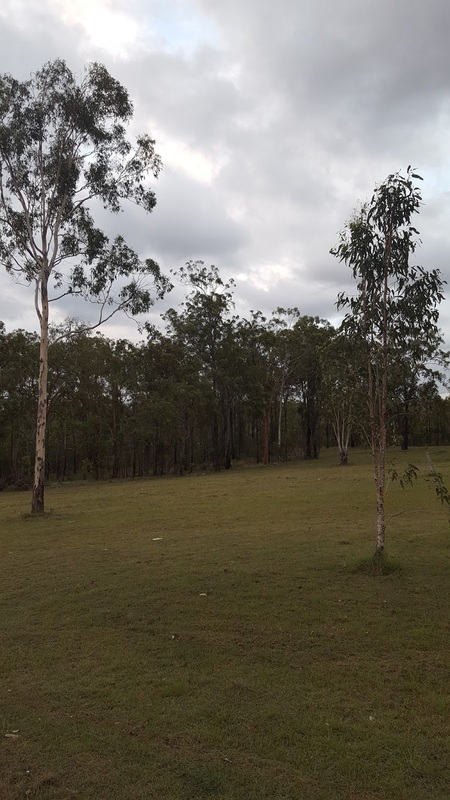 We live about 1 and a half hours from the centre of our capital city, Brisbane. Not sure what happened today, but the trip took over 2 and a half hours. My thought throughout the journey is that I don't have to do this every day and for this I'm very thankful. The second exhibition we saw was "Future Beauty:Uplate". Over 100 garments from the collection of the Kyoto Costume Institute - ranging from the classic and elegant to the outrageous. So the blurb said. From my point of view most probably fitted into the outrageous side, but it was amazing to look at what they had sewed, how they had sewed it and what they had used for both the sewing and embellishments. Www.qagoma.qld.gov.au/uplate. It's the first day of school for all mine today. So, there will be lots of stories to tell when I get home this afternoon. I feel like I've missed the holidays. It was such a busy one. We had competitive swimming until close to Christmas and then my eldest son's 21st birthday party. We managed 4 days away which coincided with some of the hottest of the holidays. I found that a bit draining. But it was good to get away and relax a little. We are heading into a busy term. Lots of swimming, two family members are in the comedy "Gallipoli Bill" and I'm making costumes for it. It's 100 years since Australian and New Zealand Soldiers landed at Gallipoli in Turkey to fight for the British army in World War 1. We lost many thousands of our young men during that battle and the ones that ensued in France. It's regarded as a defining moment in our nation's history. I've finished the stitchery for the Stitch-a-long that Chooky Blue is hosting. I'm waiting for my first instalment of the pattern to arrive from Hatched and Patched. 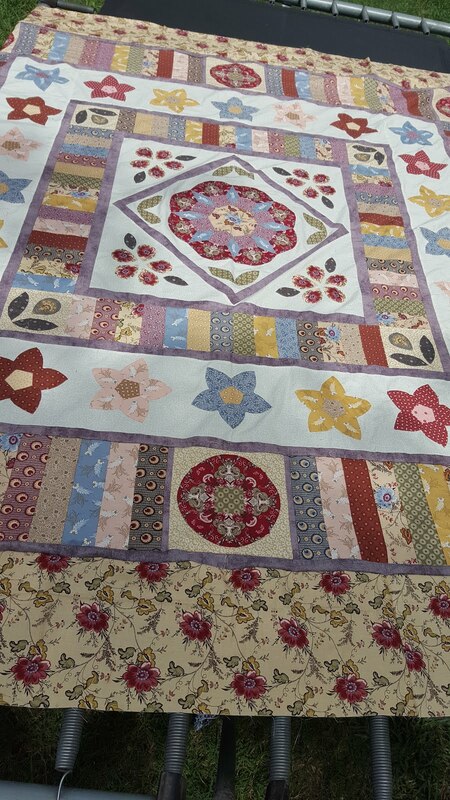 It's going to be a beautiful quilt and if I keep up with the instalments it will be finished by the end of the year. Almost time to pick my son up. About a year ago, I stumbled across Lucy Boston's "Patchwork of the Crosses". It's based on the elongated hexagon and is essentially English Paper Piecing. I know lots of others are also as hooked as I am. I bought the book and had a read and it got put away. Just recently I bought a kit on line. However, I didn't have the template. And plastic templates do make life much easier with EPP. Just before Christmas I found, Shiralee Stitches. Sandy was offering kits with template. Of course, being before Chrsitmas it was simply read and noted. Last week Sandy sent another email and it prompted me to go back and look. I ordered the first two blocks. Last night I completed the first. Loving it. Each block contains 24 elongated hexagons. You change the pattern by how you arrange the blocks and how you fuzzy cut your fabric. Love the fabric Sandy has chosen. Just my colours! She even sends little photos on how to fuzzy cut your fabric to get the look. I'm doing this on my iPad and can't work out how to post a photo. I'll go on the computer later and put one on from there. Can't believe there is not one post from 2014! It wasn't my best year ever - and I'm hoping that it will always be my worst. My parents both had health issues and my teenagers seemed to detonate in front of me. I seemed to move from crisis to crisis. I got very little sewing done - for me. I did sew costumes for a musical and a dance concert. I think, all up, over 50 costumes. But even though I like doing that, it's not quite the kind of sewing I get the most pleasure from. The theatre group I'm involved with are a great bunch of people and we have some fun times, so not complaining too much there. In 2015 I will be making costumes for two productions - one set in England in World War One (it is the 100th anniversary of the landing of Australian and New Zealand troops at Gallipoli - so will figure prominently in much of the community's thoughts this year!). I'm a "Downton Abbey" fan, so I'm really looking forward to creating costumes for this period. The second production will be "Wizard of Oz" - and it will be lots of fun, but will make a very busy second half of the year. My girls are taking a break from dancing - so that should make life a little bit easier at the end of the year. So, my list of items to sew for this year - firstly a quilt for my son's 21st. It was supposed to be finished by 19th January. With all the family dramas of the last twelve months, that is not going to happen now. 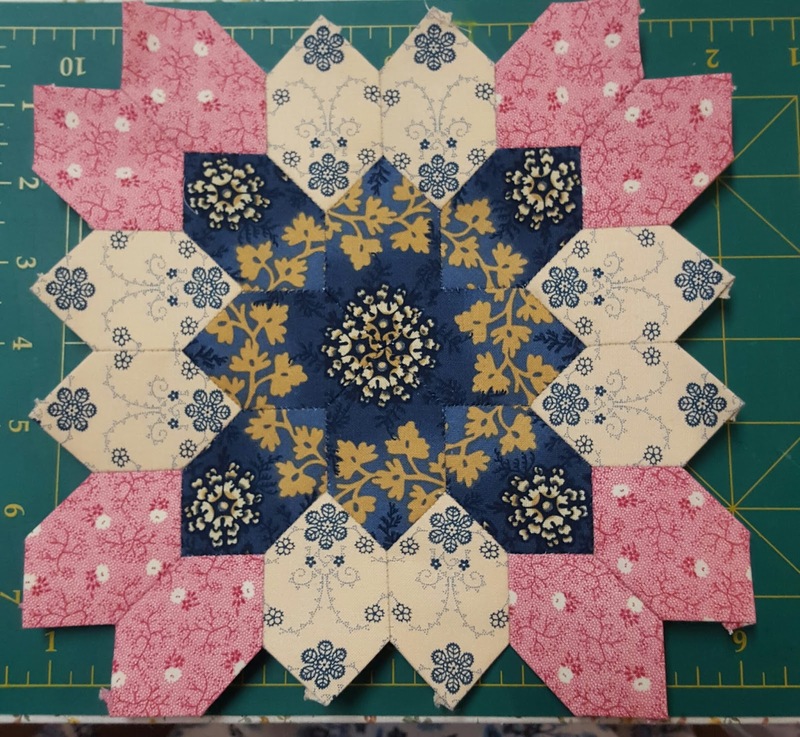 I also have a candle wicking quilt on the go. It's a queen sized quilt and I'm doing it as a BOM. I find this type of embroidery very relaxing and enjoyable to do at night. I'll post some photos of the blocks I've completed so far. I also have a hexagon quilt on the go - has been for a few years now. I would like to make lots more progress on this one as well. Of course, there will be a number of smaller projects that will take my time throughout the year. Plus my scrap booking. Always trying to make progress on that. So my next post will include photos. For this one I just wanted to get back on my blog. One of my New Year Resolutions is to be more active on my blog and to catch up with others I met when last active. Here is to a fabulous year ahead. I'm convinced it is going to be a great one. What a saga my last two projects were! I finished the three stitcheries for the April project in March. Then I lost the pattern. Then I found the pattern. Then I lost the stitcheries. I've searched and searched for them. To no avail. Thought about doing them again, but then couldn't find the pattern. I have a bit of an excuse - the builders were here fixing the damage to the house from the fire we had on New Years Eve. So a whole rom had to be packed and cleaned out as the fire had damaged the wall and floor. May came along. A busy month. My 6 monthly scrap booking retreat was on and my second son was a partner in a debutante ball. So slightly busier than usual in our house hold. This week, I was back to sorting my craft out so that I can get some organisation back into the new room and my craft room - which was used as a storage room while the builders were here. I was packing away the latest BoM package I'd received in the mail and here was the stitcheries. Yay!! This was my prompt to get going and get up to date with the monthly projects. So yesterday, I put together the mini wall hanging and made the bag. I've bought linen to make onenwith the stitchery but realised that this was going to be unrealisitic. So for now, I've taken the option of making the bag without the stitchery. It's a lovely pattern and a nice little bag. Not great photos. But I decided it was more important to write the blog and post the oictures than to get the best photos. So, Chooky, can you mark me off for April and May. I'll make a start on the June project this weekend.